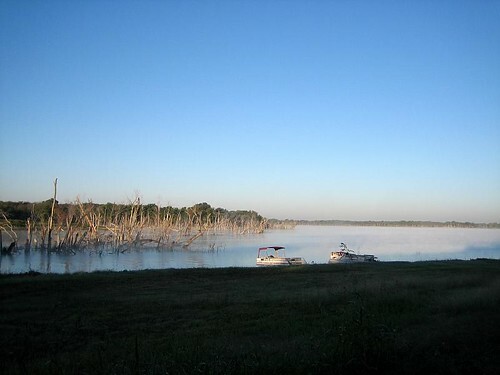 Good Morning from Waco Lake | RV There Yet? Our morning view – isn’t God kind to us? We haven’t spent much time here, at our little campsite on Waco Lake, but we were certainly blessed by this early morning sight. We’ve been here since Thursday night and most of our time has been spent helping Lara get settled in her new house. The move went smoothly – lots of young strapping co-workers showed up, Gary was there to fit it all in the moving truck, and I was busy wrapping up the loose ends and making sure no cupboard was left un-checked! Now that all the “stuff” is at the new place, you’d think we’d spend the next day unpacking. Nope. Lara & I headed out to Home Depot – and got distracted at a wonderful auction where she picked up all kinds of great stuff at really great prices. We did leave Gary behind at the house to get started on some of the moving-in chores (ones that required tools), but we needed him to come rescue us with the truck after the auction! It was a very fun (and exausting) day! We unpacked just enough to find plates and glasses for dinner – and then crashed! More unpacking is on the agenda for today – but first I need to get ready for church! Previous PostAnd so ends another weekend!Next PostHome on the range…. Blessings to you on this, the Lord’s Day.